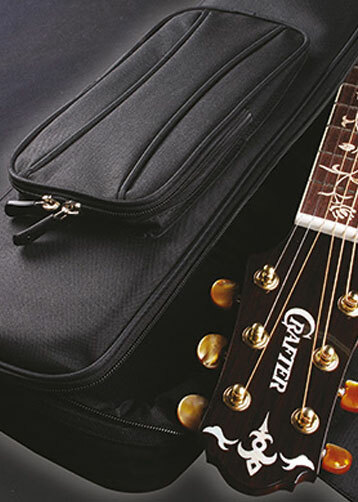 All Crafter guitars apart from the LITE and HiLITE Series come with a Gig Bag as standard. 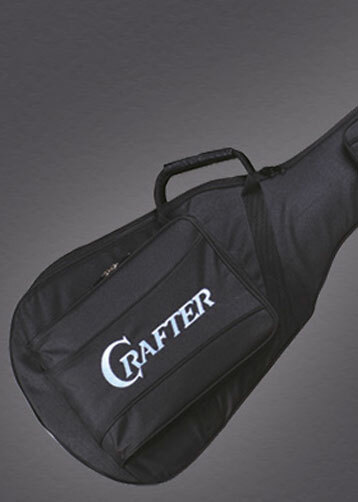 Crafter guitar Standard or Deluxe Gig Bags are shipped with each guitar except for the Crafter Anniversary Models which come with a Luxury Gig Bag. (The Luxury Gig Bag is made from thicker padding and fabric and features an extra storage pocket). Sturdy yet comfortable gig bag for your guitar. Two pockets on the front for your gigging extras plus carry straps and rucksack straps with support. Inside support for guitar neck and wrap over padding for the neck of your guitar. Thick padding surrounds the guitar for all sides. 20mm Padding, 600 Denier Material. Available for Dreadnought, Grand Auditorium, Orchestra, Classical and Acoustic Bass guitars. The Standard Gig Bags - Crafter logo designed gig bag for all your guitar essentials. Features a wrap over padding for the headstock and neck support. Includes large pocket on the front plus carry handle and rucksack straps. 8mm Padding, 600 Denier Material. Available for Dreadnought, Grand Auditorium, Orchestra and Classical guitars. Folding wooden guitar stand with engraved Crafter logo in Maple. Soft padded back to protect your guitar from scratches. The Crafter Wooden Folding Guitar Stand securely supports acoustic, electric or bass guitar, ukulele, mandolin and more. Designed to meet the needs of the songwriter or solo acoustic performer, it has quickly become a valued accessory to guitar players and collectors at all levels worldwide. Named because of its resemblance to the Macaw bird. 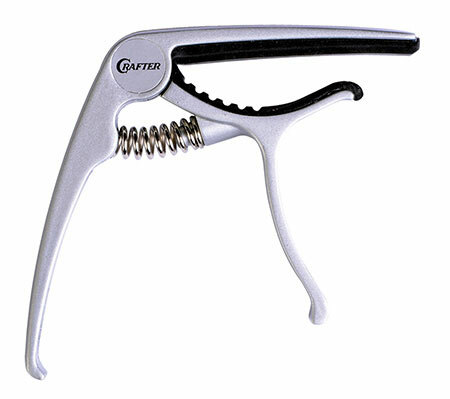 With coil spring tension system and die-cast body the Macaw Capo is robust, fits easily and allows quick position changes. The firm, even pressure on the strings provides clean ‘open strings’ without effecting the pitch.